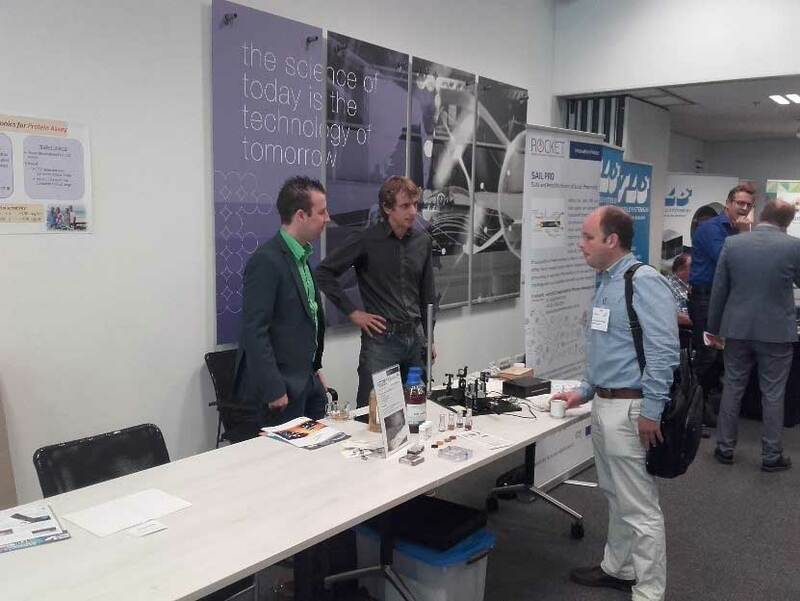 As part of the Rocket program, the SailPro project was presented on the Photonics-Event in Enschede. Within this event, we could present the idea of the cross-border project and the results and products of SailPro. The numerous visitors were interested in the laser processing process of working pieces (University of Twente) under water and the generation of nanoparticles in water by pulsed laser ablation in liquids (University of Duisburg-Essen). This different processing delivers different products. In one case nanostructured surfaces are generated and in the other case, colloidal nanoparticles are prepared to generate nano-functionalized nanocomposites. Special praise was given by many visitors regarding the cross-border cooperation. The personal experience of the event is very positive. Thus, numerous new scientific contacts could be made and also an exchange with other exhibitors at the event be carried out. Furthermore, personal experiences concerning the laser processing could be exchanged with other scientific visitors. Sebastian Kohsakowski from the University of Duisburg-Essen: “ From a personal point of view, the Photonics event was a very successful event for the presentation of the SailPro project”. At 11.45 the first workshop of the Photonics Event started, it was about photonic 3d printing of microstructures. One of the trademarks of photonics involves new fabrication routes on the micro and nanoscale. Thereby, unthought of new functionalities and materials properties arise, they open a wide range of application innovation routes. Laser-induced Forward Transfer (LIFT) is a flexible 3D printing technique, apt for various structures and functional devices. This enabling technique is on the brink of ‚lab-to-fab‘. This workshop was presented by Prof. Dr. Ir. Gert-Willem Römer together with Dr. Matthias Feinaugle and Naveed Ur-Rahman from the University of Twente in collaboration with Tim Jongman of Novel-T.
After a presentation about the possibilities with Laser-Induced Forward Transfer (LIFT) technology, used for the 3d printing of microstructures the participants parted in groups to discuss the main question of this workshop: For which unique applications can LIFT facilitate production? Dr. Matthias Feinaugle on the workshop: “I thought it was a very useful idea to have this workshop. The participants seemed very enthusiastic and keen on sharing their insights on what the potential of our technology could be. We have a few new routes of establishing collaborations and projects to explore in the coming weeks. I think it also helped the interested outsider to learn more about laser additive manufacturing”. The second workshop was presented by Dr. Han Zendman of NYtor. One of the trademarks of photonics involves new diagnosis and treatment routes within healthcare and agrifood. For example, in food security, produced vaccines in poultry need to be tested extremely careful. VaxChip (a ROCKET-feasibility study) is such an innovative molecular diagnostic tool to perform multiple tests, detecting an array of pathogens in just one go. Han pointed out the feasibility study together with Lionix was a huge success. The detection route combining the (patented) molecular beacon technology of Nytor with Lionix TriPleX platform (highly sensitive, using integrated optics (interferometry) on-chip for detection) proved feasible for testing vaccines in poultry. ‚The detection route resulted in clear detection methods, in lab situations as well as under practical conditions using real egg environments‘. In his presentation Han focused on the molecular beacon technology and the multiple deployment in pharma, agri/food, veterinary and environment/water applications. In clinical (antibiotic resistance screening) and in veterinary (influenza detection H5/H7/H9 types) first applications are already operable. Also here there was enough time to discuss the main question of this workshop which was: What would be the time-to-market for a DNA-sensors applicable outside the lab-environment, and what is needed for that? In his contribution for SME companies, dr. Arne Leinse, chief commercial officer of Lionix International, stressed the key enabling technology characteristics of various photonics application areas. Communication (f.e. optical fibers), entertainment (consumer electronics), health (monitoring), manufacturing (laser welding and printing), energy (solar cells) and agriculture (indoor farming) are no longer imaginable without photonics acting as a driving agent. Lionix International is a leading global provider of customised microsystem solutions with integrated photonics-based solutions, in scalable production volumes. In 2001 Lionix started with light on a chip solutions. Merging with XiO Photonics & SatraX in 2016, now the company has grown towards 50 employees, more than 50% of which did finish a PhD track. In his contribution, Leinse points out a disruptive approach in photonics is forthcoming as mobile data growth, more wireless users, more connected devices and faster connections in 2020 is foreseeable. The estimated photonics market in 2020 is estimated to be 612 bn euro. Worldwide a total European share is of 14% (excluding photovoltaics) is estimated. Main contributions will be: laser materials processing and lithography; measurement and image processing; medical technology and life science; optical components and systems; lighting; defence and security. In his talk Leinse mentions seven technology platforms: free-space photonic components and systems; Glass and polymer specialty fibres and fibre devices; Polymer-based photonic components and large-area oragnic-phontonics; Micro0opto-electro-mechanical systems; Silicon Photonic Integrated Circuits; InP-based photonic ICs; and: Si3N4 (siliciumnitride) and SiO2 (siliciumdioxide) passive waveguide technologies. In the last category Leinse himself is active as a project leader. European SME’s will easy access realising photonics innovations via ActPhast 4.0 programm.